Agents utilizing border surveillance technology witnessed a man walking northbound from the border about 10 miles east of the San Luis Port of Entry. The man appeared to have dug under an outdated section of the border barrier that does not have a concrete base to prevent tunneling, according to Yuma Sector Border Patrol officials. Ground-based agents arrived on the scene and took the man into custody. The agents transported the man to the Yuma Border Patrol station for processing and a biometric background investigation. A check of criminal database records revealed that a court in Fresno, California, convicted the Mexican national in 1984 for involuntary manslaughter. The court sentenced him to 11 years in state prison. The previously deported criminal alien also admitted to being a member of the Border Brothers street gang. Officials stated that the Mexican national will be prosecuted for illegal re-entry after removal as a convicted felon. If convicted on the federal felony charge, the migrant could face up to 20 years behind bars. The Mexican national crossed under the border in the same area where 376 migrants illegally entered the U.S. one week earlier. The group became the largest to illegally cross the Arizona border with Mexico, Breitbart News’ Robert Arce reported. The Yuma Sector has been reporting numerous large groups of migrants illegally crossing the border. During a week-long period in November, more than 1,000 crossed in multiple groups. 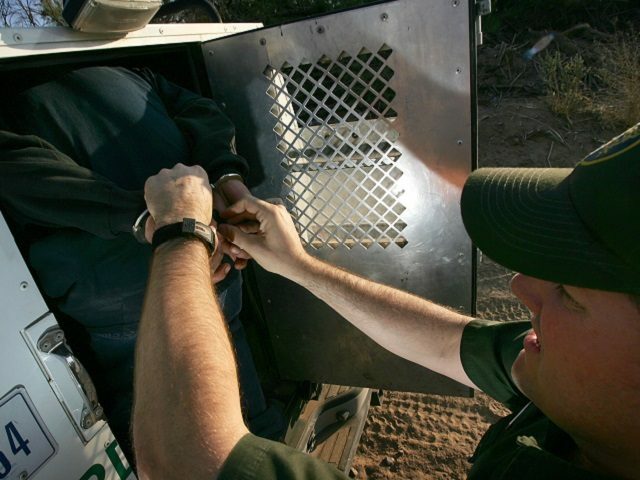 “All persons apprehended by the Border Patrol undergo criminal history checks using biometrics to ensure illegal immigrants with criminal histories are positively identified,” Yuma Sector officials warned. Bury these under the wall...we have millions of them!!! Backfill them with dirt, they are very heavy to remove. Pour the concrete base on top! It cleans up our junkyards, it recycles them and make it harder to dig under the wall.